Welcome to the Imperial Band Instruments repair department! 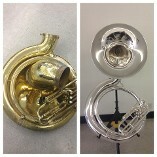 We strive to provide the very best in band instrument repair. Because our quality control standards are high, our expert technicians are among the best in the business. Our goal is to always deliver a guaranteed repair in the quickest turn-around for the least expensive price possible. We want you, our valued customer, to be happy.